Bacon and scallops. According to Jakub Dzamba, a PhD architecture candidate at McGill, this is what wax worms taste like. Most of you probably just gagged. That was my first reaction as well. The very idea of insects as food is shunned in most Western cultures, with bugs viewed as nothing more than pests. But entomophagy, the practice of eating insects, dates back to the earliest humans. The Indigenous peoples of Australia enjoyed eating cooked moths and the ancient Algerians harvested locusts. Even Aristotle wrote of eating cicadas — according to him, the young ones are the tastiest, and among the adults, the egg-laden females are best. In today’s world too, entomophagy is a common practice. In many countries, insects are eaten on a regular basis and even considered delicacies. According to the UN, an estimated two billion people around the world include insects in their diets, from dry-roasted crickets to stir-fried palm weevils. Westerners tend to view insect aversion as the norm, but in reality, it’s a perspective that’s really only prevalent in North America and Europe. 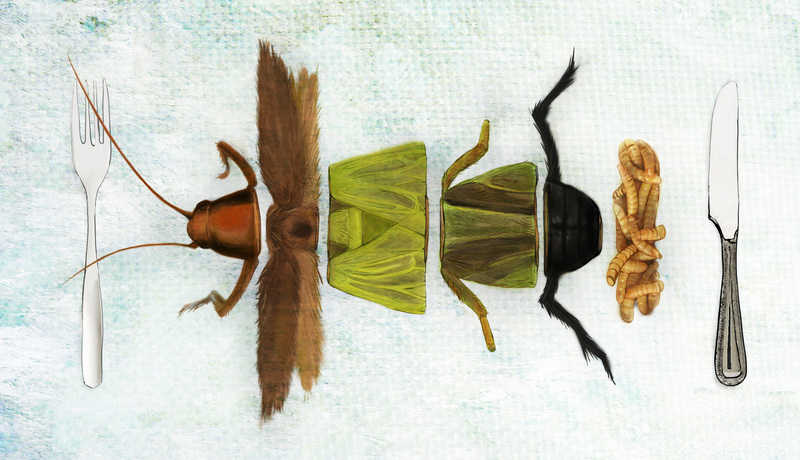 In the rest of the world, insects are not just considered pests — they’re viable food sources. However, with the age of globalization comes the spread of ideas and, slowly but surely, entomophagy is gaining momentum in Western countries. Across North America and Europe, numerous companies have started to raise food-grade bugs, and many restaurants have opened that boast dishes featuring insects. Here in Montreal, chef at Limon, David Ali Garcia plans on creating a five-course, edible, insect-centred dinner. From August 26 to 28, the first entomophagy conference in North America was held here in Montreal as well. Called “Eating Innovation: The Art, Culture, Science and Business of Entomophagy,” it provided a forum for people to get together and discuss the benefits of insects as food. By doing things differently, she means eating insects. Rearing bugs for food requires a much smaller amount of feed, land, and water than traditional livestock. For every ten pounds of feed, a cricket colony gains four to five pounds of body mass, which is significant when compared to the single pound that cows put on. “Insects are cold-blooded, so they’re much more efficient at converting feed into body mass,” said Dzamba. Perhaps the most significant advantage of entomophagy is its sustainability. We live in a world of dwindling resources, a world that will have to feed nine to ten billion people come 2050. And they’re good for us, too. As a protein source, insects are comparable to chicken and pork, and crickets are high in healthy omega-3 fats. Considering their nutritiousness and sustainability, it’s strange to think Westerners haven’t used insects as a food source yet. It can’t be due to taste. Crickets purportedly taste like roasted almonds or cashews, flavours well-loved by many. According to Handa, mealworms have a subtler flavour, much like popcorn. With many insects, they’ll simply take on the taste of what they’re cooked with, much like chicken or beef. And as Dzamba stated, wax worms boast the flavours of bacon and scallops. Most would deem these flavours enjoyable, so taste is not likely the crux of this species-spanning aversion. No, the culprit is socialization. From a young age, Westerners are taught that insects are pests, fit for extermination rather than ingestion. Given the prevalence of poisonous bugs in the insect population, this aversion actually makes good evolutionary sense. But in today’s world, we know which insects are edible and which are not, which eliminates the need for this all-encompassing avoidance. But learned associations from childhood are difficult to break — though not impossible. Before insects can become a staple food source in North America and Europe, people must overcome this reflexive association with disgust. Dzamba says that Future Food Salons, events where groups of people get together to try eating insects, are a great way to introduce yourself to entomophagy. Insect flour is also a popular route, enabling people to dissociate from the image of bugs. The other main obstacle to overcome is production. Currently, there is far more demand than supply of food-grade insects, resulting in grossly inflated prices. Although insects are cheaper to produce than other meats, the price is around $9 per pound right now because of the inability to meet the demand. Handa predicts the price will fall to $4 or $5 per pound once the issue of supply and demand is addressed. Until then, an affordable way to include insects in your diet is simply by raising them at home. Third Millennium Farming sells at-home cricket farms that enable people to raise food-grade crickets on nothing more than food scraps.